This gorgeous pastel candy blue colored banner necklace by House Of Wonderland is the perfect addition to any Introvert's jewelry collection. Perfect for treating yourself, brightening someone's day, or a little something to pop in a card. 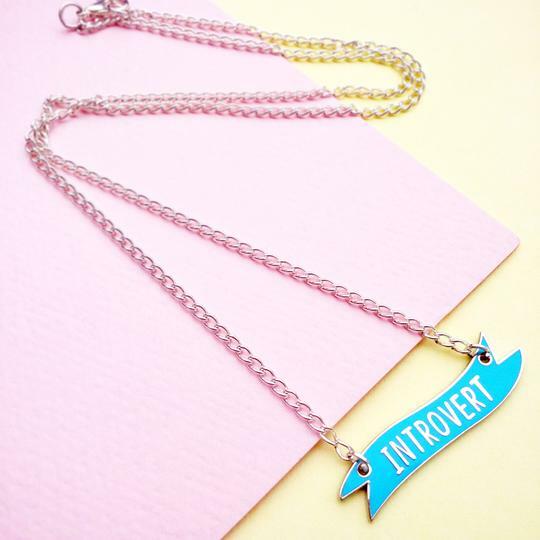 The stunning shiny hard enamel banner reads 'INTROVERT' and is approximately 1.5" x .25" in size on an 18" silver-colored chain. Subtle enough for everyday wear whilst still making a statement. Will come on a card in a clear cellophane bag and inserted in a black velvet drawstring pouch for instant gift giving. Mailed in bubble pouch envelope.